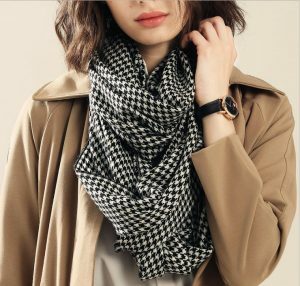 A small square scarf is exposed around the neck, and the visual center of the people will move up, and the whole person will be taller. If you are afraid of heat in the summer, you can also use it as a hair band and wrap it around your hair. It is also very beautiful. Hanging on the scarf on the neck, you can always leave a different style. In the air-conditioned room, you can use it as a shawl. It can resist the cold air of the air conditioner. When you sleep, you can cover the face to block the light. When you blow the wind, please tie it to your head. It is full of Arabian-style beauty. No one can think of it under the headscarf. Can’t see people’s hair; when you can’t find a seat, please put it on the stone, it won’t be cold in winter. The main role of cashmere scarves is to withstand the cold. It is also practical to wrap it around the neck in winter, providing warmth and a coat to the concave shape.